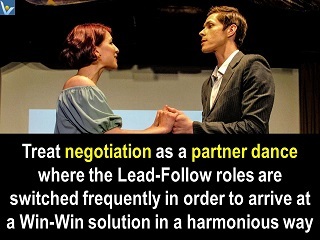 Treat the negotiation process as a partner dance where the Lead-Follow roles are switched frequently and willingly in order to arrive at a Win-Win solution in a harmonious way. 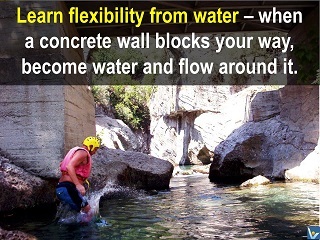 While being strategically focused on the desired outcome, be tactically flexible, like river water, in your approaches to selecting or inventing the routes towards the desired results. 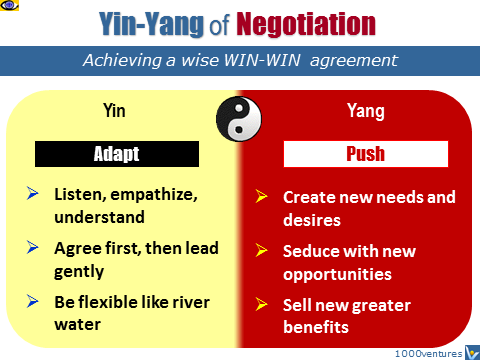 Avoid confrontational negotiations because they put your opponents in a defending position and make them argue back. So, agree first, then push your argument gently, for instance in a form of an open question inviting the counterpart to explore the situation from a different angle. Treat problems as → opportunities they usually bring about. There is an old saying, "There are no problems, only opportunities.“ Don't talk about a problem too much; discover and talk about opportunities that would benefit the both parties. 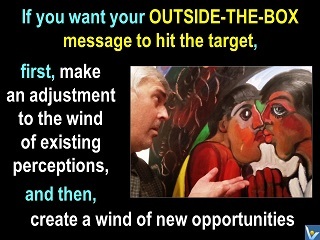 If you suggest an outside-the box solution, know also how to sell it. To create new powerful desires, invite the other party to spend the first 5-10 minutes exclusively on creating a list of mutual benefits the solution brings about. If you both find this outside-the-box solution worth exploring further, spend some more time on playing a quick INNOBALL simulation game with it to conquer jointly its diverse enemies and develop a strong implementation strategy.